Hard to think of a better way to start your work week than a juicy Star Wars rumor, right? The latest one is a doozy and it concerns Felicity Jones’ lead role in 2016’s Star Wars Anthology: Rogue One. Rumor is, she’s the daughter of Boba Fett. Before we dive into that, let’s set the table a bit. Rogue One is the first Anthology film, the fancy name of the Star Wars standalone movies. It takes place right before Star Wars Episode IV: A New Hope and focuses on the group of scoundrels who steal the plans for the first Death Star. The very same plans Princess Leia puts into R2-D2 that get the whole ball rolling. Gareth Edwards (Godzilla) is directing from a script by Chris Weitz (Cinderella) with Felicity Jones (The Theory of Everything) starring. As of now, she’s the only confirmed cast member but other rumored ones include Forest Whitaker, Riz Ahmed, Diego Luna and Ben Mendelsohn. Back to the rumor. 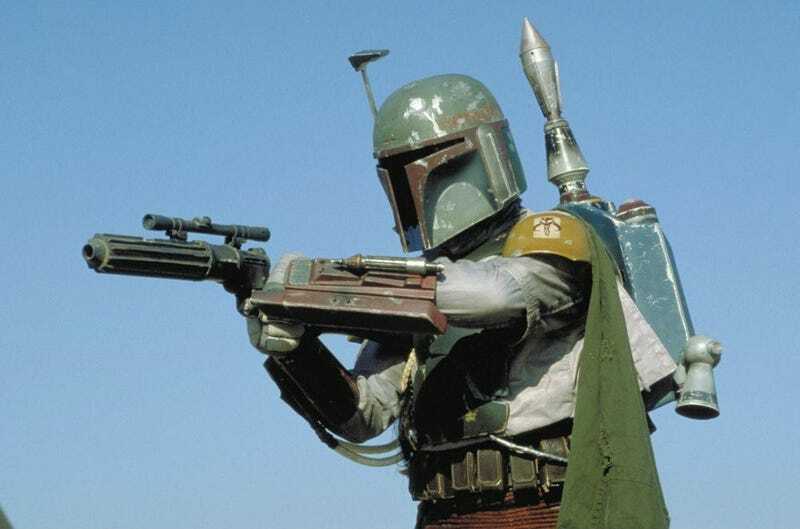 We know Boba Fett is a character Lucasfilm and Disney want to use in their grand Star Wars plans. Though it’s also never been confirmed, the Anthology film Fantastic Four director Josh Trank was going to direct was likely some kind of Boba Fett movie. That film’s been shelved now in favor of the 2018 Han Solo movie. But Fett still lingers. In canon, we know Fett is the clone son of Jango Fett. Jango was killed by Jedi Mace Windu and Boba was left with a strong disdain for the Jedi. From there, the next time he appeared (on film) was at Mos Eisley alongside Jabba the Hutt. In the comics, it was revealed Fett was hired by Darth Vader to find out the name of the Rebel pilot who blew up the Death Star. A mission that turned out to be incredibly important. All that’s missing is the entire arc of how this young boy became the most notorious bounty hunter in the galaxy, trusted by a Sith Lord. There’s a lot of ground to cover there and, sure, he could have had a fling in the middle. The physical act of Fett having a daughter isn’t what’s fishy here. It’s how this would make the Star Wars universe seem smaller. The whole point of the Anthology films is to expand the universe out and tell stories that are independent of the main, Skywalker-centric story. If they are planning a Boba Fett movie down the road, why link them? What does Rogue One gain from linking Jones’ character and Fett? In theory it would give her a massive chip on her shoulder. Especially since Jones’ character is likely a good guy. And while it would seem to be an odd coincidence, it’s still just kind of cool, like anything relating to Boba Fett. As for the source of the rumor, it’s lead editor of Heroic Hollywood, Umberto Gonzalez, who has a solid track record with this kind of thing. That said, he didn’t run it on his site. He dropped it on Meet the Movie Press (52 minutes in, link below) and stressed he wasn’t running it on his own site because it’s such a huge, unconfirmed rumor. But like most rumors, even if it’s not true, it’s fun to think about.